My next destination after Copenhagen is Oslo, the capital of Norway. This writing is the second part of my posts about exploring Scandinavian cities (Copenhagen, Oslo, Stockholm). I arrived in Oslo early in the morning by SAS flight. Just like in any other airport that I visited for the first time, I quickly got myself two bottles of water, then starting to follow airport signs to find the counter to buy tickets to Oslo. We can choose from few options to get to Oslo. First, Flytoget express train. This is the fastest method (approx 22 minutes), but more expensive. Second, Flubussen airport coach (approx 40 minutes). This bus stops at Radisson Blu Scandinavia Hotel via the Oslo Bus Terminal, Clarion Royal Christiania Hotel, Helsfyr and Furuset. We can also choose to take NSB train (regular train), or even taxi that will cost you a fortune because Oslo Airport Gardermoen is rather far from Oslo city. I choose Flytoget instead of regular train because I carry reasonably big suitcase and Flytoget trains are better equipped for travelers with dedicated space for us to store suitcases. Initially I was tempted to buy Flybussen ticket, but decided not to take the option because of the long travel time. A nice lady at the ticket counter told me that it would be more expensive to buy the ticket from her. Then she showed me the ticket machines where I can buy cheaper Flytoget tickets. In Copenhagen I decided to buy Copenhagen Card. In Oslo they offered Oslo Pass, but this pass does not include any transport from the airport to Oslo city. I asked for Oslo Pass and apparently it was not sold at the Flytoget counter. Oslo Pass can be purchased from most hotels in Oslo city. The machine has language selection, and English is available. We are required to specify which station we plan to get off the train, with Oslo S is displayed as the default destination. I don’t have a problem because I have searched the station name. There are only 8 stops: Lillestrøm, Oslo S, Nationaltheatret, Skøyen, Lysaker, Sandvika, Asker and Drammen. I paid NOK 170 for one way ticket to Nationaltheatret station. I assume they might have different rate for different stops. The machine allowed us to purchase a return ticket, and so I did. It’s probably important to mention that Flytoget trains are NOT 24 hours. The earliest schedule (by the time of this writing) is 05:30 am and the last train departs 00:50 am from the airport. 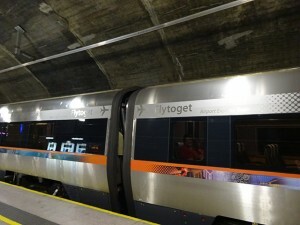 The earliest return train from Oslo S is at 04:40 am (or 04:34 am from Nationaltheatret) and the latest return train is at midnight from Oslo S. Our printed tickets are basically magnetic card that we use to enter the automated gates into the train platform. The travel time is 22 minutes to Oslo S and 28 minutes to Nationaltheatret. 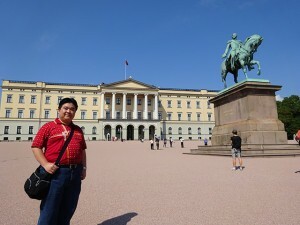 My hotel is located near Royal Palace in Oslo. It appeared as a close walk in Google Maps. What I didn’t know, is that the short walk from the train station is actually an uphill walk. Well, nice little surprise to wake me up in the morning (the flight was early and I was still sleepy from the lack of sleep). When I arrived at my hotel, I quickly realized that I should have taken the Flybussen instead. The bus stops right in front of the hotel ! That would save me a lot of energy. Ah well, imperfection and occasional wrong choices are part part of adventure, I guess. Oslo city is beautiful and noticeably clean. However, I don’t find many colorful buildings that seem to be a common view in Copenhagen. Most buildings in Oslo are more “normal”, with some of them still have the classic design preserved well. 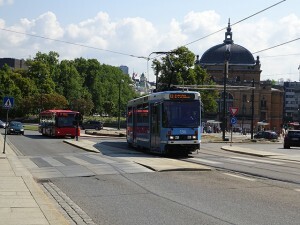 Plus Oslo has trams ! As a proud Melbournian, I find that every city that has trams is a bit cooler than the others. Obviously, the first action is to get Oslo Pass from my hotel. When I asked the lady about Oslo Pass, she offered a cheaper card that gives unlimited ride on public transport, but no free entries to museums. The price difference is significant. And I kinda remember that museum entrance fees in Copenhagen (my adventure a day before) were generally not that expensive. So I decided not to get Oslo Pass, and choose the other ticket just for unlimited public transport rides. This was something that I regret later. I started my exploration from the closest important place: The Royal Palace. It’s a nice large building, with huge park around it. There are a large green statue at the front, a man on his horse, just like few others that I saw in Copenhagen. There are guards around the palace. Each of them had dedicated standing location. Once every few minutes they moved and walked around. A lot of visitors find this pattern interesting and they took a lot of photos. The front side of the palace were very crowded because people are watching the guards and their unique rituals. I moved to the right side of the palace and found another guard that no one notices. I set up my camera tripod to take some photos on the adjacent garden and he seemed to be interested, I could see his body gestures are looking at my tripod. So I picked up the tripod closer to him and asked him if it’s alright for me to take a photo with him using some random hand gestures. He nodded. Then I set up the tripod and triggered the timer in my camera, then I run towards him and took a nice photo. I thanked him after that and he answered “you’re welcome”. 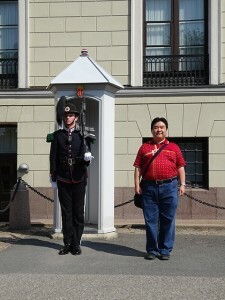 Oh wow, I always thought that guards of royal palace are not allowed to talk because their work is to stand still undisturbed at all times. Apparently they are allowed to talk. Anyway, soon after I took my photo, people noticed our photo taking and he became popular. People were queuing for a photo with him after I left. I found “beware of pickpockets” in many bus stops. Well, I didn’t have any bad experience there, but I wonder if crime rate is actually high in Oslo, or those signs are just preventive measures after 1 or 2 cases. Hopefully the later. Some little tips related to money, if you plan to use your credit card (or debit card) in Scandinavia, don’t forget to set a PIN. Most stores will only accept PIN and won’t even allow us to use signature. The PIN must be exactly 4 digits. Longer PIN will not work there. If you try to ask some locals about where to find an ATM, they might have no idea what an ATM is. In Europe (including Scandinavia) they call it bankomat. Withdrawing money from ATM (bankomat) will generally give you better exchange rate compared to money converter outlets (but might be different for each bank). Bank ATMs are generally have lower fee compared to third party ATMs that are not affiliated with bank. You should check with your credit/debit card issuer about withdrawal fee. Of course, carrying sufficient cash is always the best idea. Personally I am not a big fan of those prepaid travel cards. I have checked several times and most of the time their exchange rate is higher, plus some of them charge additional transaction fee. 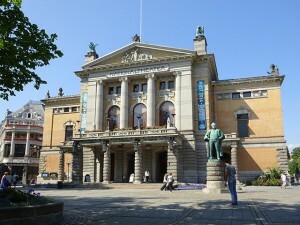 After visiting Royal Palace, I walked around the city and visited The National Theatre, Stenersenmuseet (Stenersen Museum) and Oslo City Hall. Then I took bus towards Bygdøy area, heading to The Fram Museum (Frammuseet). It is a museum where they keep a polar vessel called Fram. Norwegian people was one of the first countries to explore the North pole and I think it’s awesome for them to survive the extreme weather using some very basic equipments from more than 100 years ago. 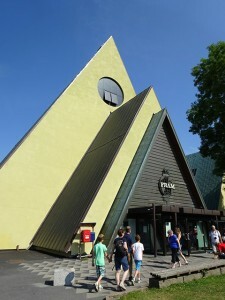 Next to Fram Museum, there’s another museum called Kon-Tiki Museum (Kon-Tiki Museet). Kon-Tiki is the name of a ship used by Norwegian people to explore across the Pacific Ocean from South America to the Polynesian islands. 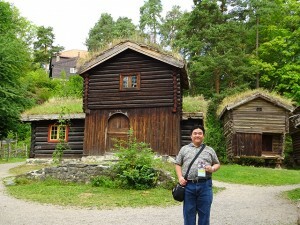 Since I always like stories about vikings, the next museum that I visited was Viking Ship Museum. 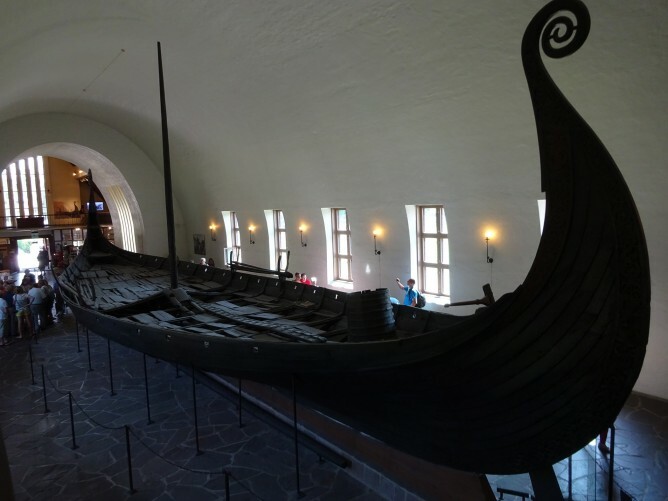 They have few ships from the viking era, with most parts of the ships are original. To get better view of the ship, we need to climb some stairs to few lookout spots they have prepared. Certainly we get better few from up there. But fatigue are building up from all the stairs climbing, especially that I just had a long walking day in Copenhagen, just a day before. It’s probably worth to mention that the location of bus stops in Oslo can be a bit tricky. When we get off our bus at a particular stop, we would expect that to go back we need to cross the street and wait at the bus stop there. This was not always the case. Sometimes there is no bus stop across the street and the bus stop to go back is located somewhere else around 5-10 minutes walk. The return route is not always taking the same route as the arriving route. Thanks to one mistake that caused me to walk almost 15 minutes, I checked Google Maps before starting every journey and paid attention to the route. To make things even trickier, the bus route shown in Google Maps doesn’t actually follow the actual streets. It showed straight lines between stop locations and the GPS locations of those stops sometimes missed a bit, making it harder to find the actual bus stop. Actually there was still one more museum I wanted to visit on the first day. But since I was tired, I decided to go back to my hotel. According to my Fitbit tracker, I have climbed 37 floors (370 feet, or 122.8 m) on that day. Day 2, I woke up fresh and ready for another exploration day. The first destination was Vigeland Park, this is a very unique location in Oslo. A park full of artistic sculptures. All the sculptures are humans in naked condition. Actually the name of this place is supposed to be Frogner Park, and the area with the sculptures are called Vigeland installation inside Frogner Park. Somehow “Vigeland Park” becomes the more popular name. 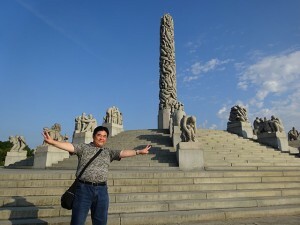 I took a bus to the entrance gate of Vigeland Park. Immediately after entering the park, I saw some art displays that are.. rather unusual for me. Those sculptures are unique and admittedly artistic. Yet the fact that all the sculptures features naked human beings, was rather striking. I explored from the right side, walked to the centre monolith, then returned from the left side. For me, the display I saw there was beautiful and amazing. It showed me human beings in our most natural condition without any sense of sensuality. But I can clearly understand that not everyone would have the same opinion. From Vigeland Park, I took another bus to reach the one museum I didn’t have the chance to visit on the first day: The Norwegian Museum of Cultural History (Norsk Folkemuseum). It is a huge open-air museum with more than 150 buildings. We can see some historic buildings to the “old” version of Norsk modern city. I almost thought the museum was just as large as the first few buildings. I didn’t realize there was a path that I could take to see even more buildings and exhibitions. Thanks to the map they gave us, I realized that this museum is way larger than what it seemed from the entrance. It was after paying the ticket to enter this museum (NOK 100), I did a quick calculation on the money I spent so far on museums. I should have gotten the Oslo Pass instead. Not only it would simplify my journey, it would also remove the “burden” of thinking about entrance fee. If I ever go to Oslo again, I will definitely get the Oslo Pass. I needed to catch another flight to Stockholm at 4 pm, so I only explored until near mid-day. Then I returned to the hotel, checked out, and headed back to the airport. I almost entered the wrong gate in Oslo Airport. I read the boarding gate mistakenly, and almost joined the immigration queue for flights to countries outside Schengen area (flights within Schengen countries do not involve immigration check). Since I had extra times, I browsed around airport stores hoping to find some good bargains on tech stuff. Interestingly I saw gold iPhone and gold iPad on the display of a duty free store, with insane price of course. I wonder who would pay such prices for a product with last year’s technology. So I finally got to the right boarding gate, excited for my next adventure: Stockholm.